Sometimes a stupid man is only a couple of good guesses away from looking clever. -Philip Kerr, "The Lady from Zagreb"
According to a Forbes article from 2009, many of the cities I've visited recently rank on the "World's 20 Best Places to Live" list. The cities on that list that I've been to are Stockholm, Berlin, Brussels, Amsterdam, Copenhagen, Frankfurt, Vienna, Sydney, and Vancouver. And you know what? As great as those cities all are, I have no desire to live in any of them, or the remaining eleven on the list. One city that didn't come close to making Forbes' cut is Zagreb, the capital of Croatia and a city that I'd totally live in. Zagreb may not be postcard picture-perfect like many of Forbes' selections, and I love this. 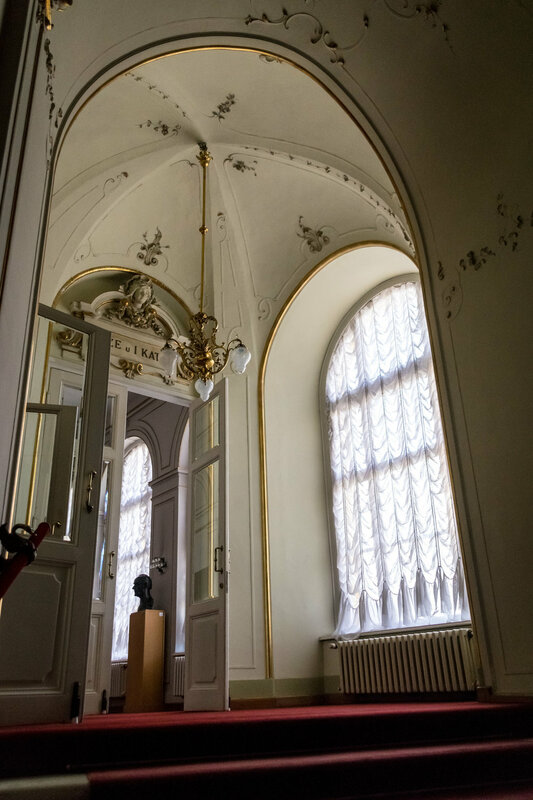 I see Zagreb as an authentic city that doesn't draw the crowds like I imagine it did in the 1930s, when the Orient Express pulled into the neoclassical style train station, but is quietly preparing for a roaring comeback. 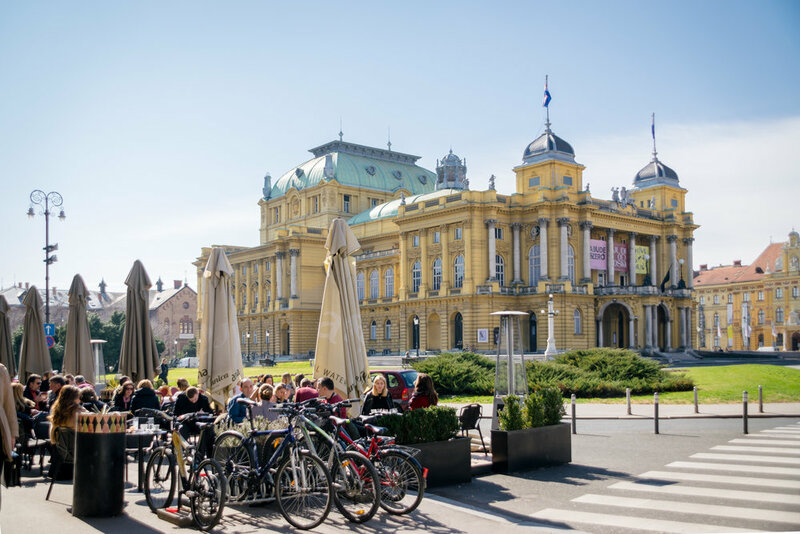 Even though I've only been to Zagreb twice for a week total, both times I felt a strong connection to the city and a sense of belonging and ease. I felt like a local and wasn't jammed elbow-to-elbow with tourists; I spotted a water fountain or two and had no trouble finding an atm. And after exploring other European capital cities, I was so happy to return to rough-around-the-edges, less paternalistic, and beautiful Zagreb. The city has this special energy and charm, and any place that uses hearts so generously in its tourist campaign can't be all that bad. So, I will add Zagreb to my list of cities that I'd like to live in for a year or two. But forever? I don't know if one place will ever capture my heart forever, even if it's in the business of hearts. Zagreb has a long history with stage performances, one that dates back to the 11th century. That being said, it's only fitting that they have a grand theater built in the neoclassical style and opened in 1895. 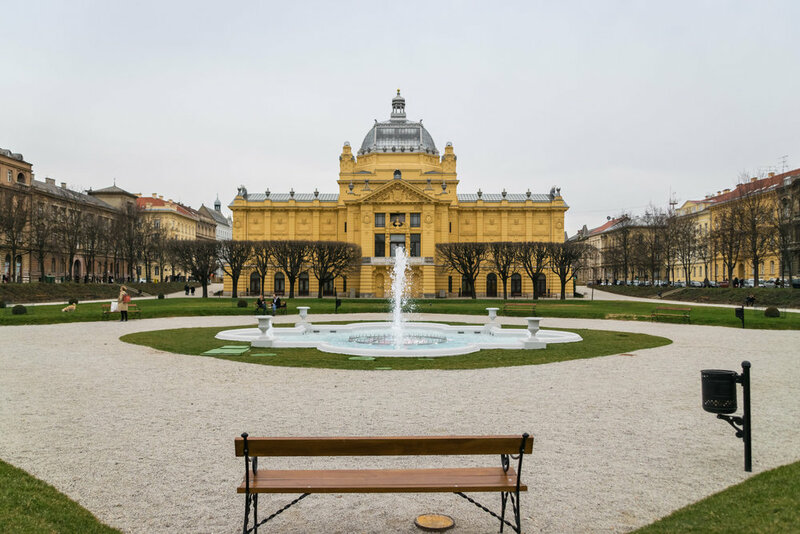 Respected Viennese architects Ferdinand Fellner and Herman Helmer designed the Croatian National Theatre, known locally has HNK, and its breathtaking exterior and stunningly opulent interior are straight out of elegant Vienna. While walking around the neighborhood, I stopped in for a peek; I'm not sure if it was open to the public, but the theater employees didn't stop me from exploring a bit (unlike Hamburg's theater staff, who wouldn't even let me in the lobby). I found an unlocked door on the top floor and opened to it to the delightful scene of ballet dancers practicing the evening's performance. I stood there for a few minutes taking in the grand setting, dark but still distinguishable. One day, I hope to return to the theater for a live performance. This distinguished art nouveau building interestingly enough served as the National and University Library when it first opened, with the state archives occupying a small portion of it. There is a great description of the building on the CSA's website and daily tours are offered for just a few dollars, although the lady at the front desk seemed clueless about them despite the sandwich board sign and posters on the door. I wandered around the grand facility and most of the doors were closed, but I enjoyed taking in the colorful stained glass windows and mosaic tile floors. Croatian artist Vlaho Bukovac created the large mural in the reading room, and after visiting his home and studio in Cavtat last year, I better understand the significance of this. 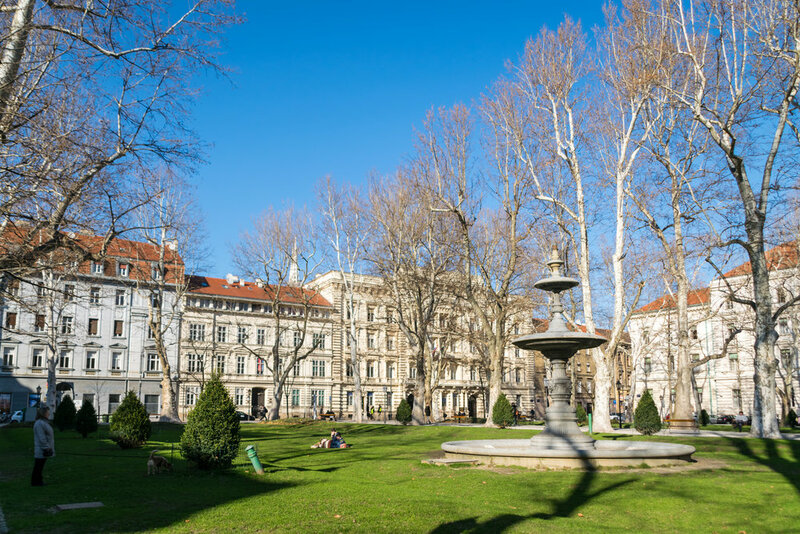 Founded in 1889 by a university professor in Zagreb, this beautiful little garden is hidden in plain sight. I visited in early March and the weather was unusually spring-like (hooray for global warming), so everything was coming out of hibernation. Zagreb's botanical garden is a few minutes' walk from the train station, something to keep in mind for weary visitors arriving or making transfers in the city. The wooden exhibition pavilion from the late 1800s was completely restored in 2007, and was closed when I visited.